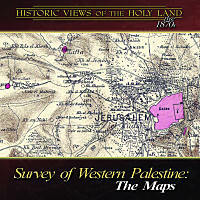 This volume is an electronic collection of the maps produced by the Palestine Exploration Fund's Survey of Western Palestine. The original publication includes 26 sheets of maps at a scale of 1 inch to 1 mile. The electronic edition includes the original sheets at high resolution, ideal for research, teaching, and printing. Some additional features are included in this electronic edition, never before available. For more information about the significance of the Survey of Western Palestine, see the essay by the producer below. The Sheets: All 26 original sheets, plus 1 of Eastern Palestine, are included in the highest resolution. These will print at a size of approximately 2 feet (60 cm) square at 300 dpi. This resolution is ideal for all research and printing purposes. Sections and Regions: For ease of use, sheets of the map have been joined together to form east-west sections and regional blocks. These maps give a broader perspective than the individual sheets. Places of Interest: For quick reference, about 50 locations have been selected as a "place of interest" (see map with selections here). 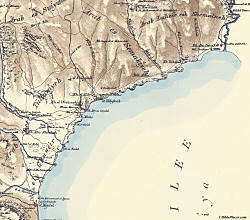 These maps are selected areas from the individual sheets, included at the highest resolution. These map sections are also included in a PowerPoint file. Index: We have created an electronic version of the extensive index, downloadable for free. Volumes: See this page for links to volumes available for free download. Sample Maps: Click on thumbnail for larger images - these are 25% of the resolution of the maps in the collection. 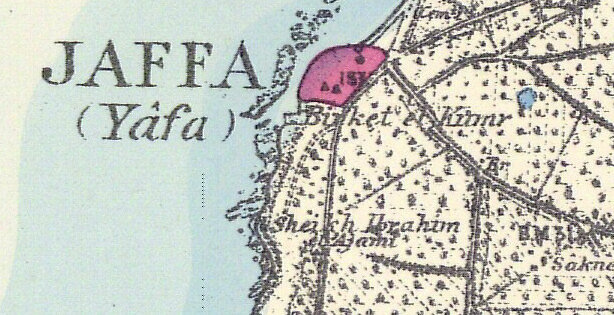 In the early 1870s, the Palestine Exploration Fund of Great Britain sent out a team of explorers to make a careful survey of the land west of the Jordan River. 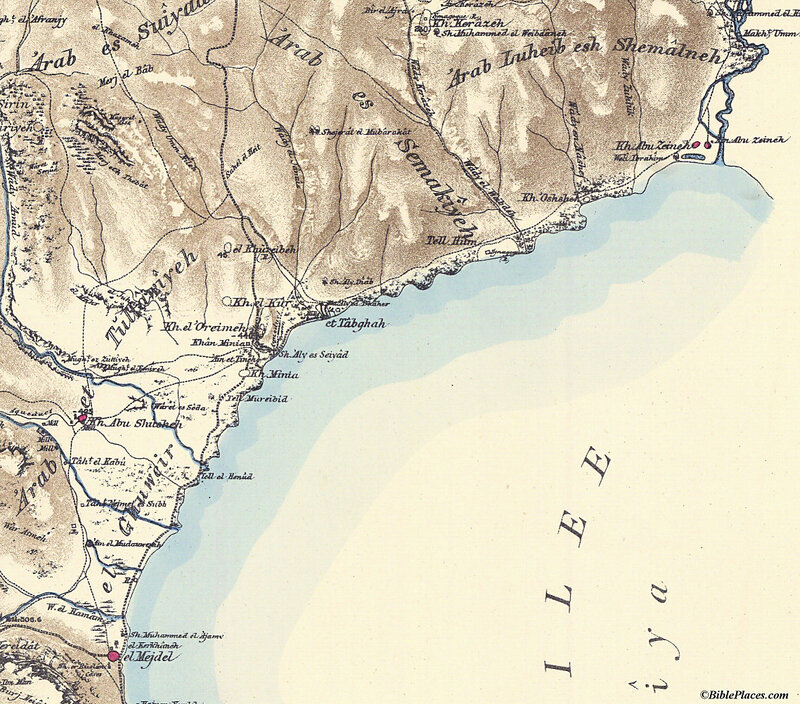 Published in 1880 at a scale of 1 inch to 1 mile (1:63,360), the map collection included 26 sheets, each one approximately 2 feet (60 cm) square. This undertaking was extraordinary for its day, and was the first scientific map of the Holy Land. What the surveyors could never have known, however, was just how valuable their work would be to future generations. Within a few years, the First Aliyah began, and increasing streams of Jewish people moved to Palestine in the following decades. The Arab population was also exploding because of a high birthrate. Riots, uprisings, and wars in turn led to major changes in the locations of populations. Sites which had long preserved ancient names were abandoned. Old cities were expanded and new cities were built. One hundred years later, the map of the land is radically different. 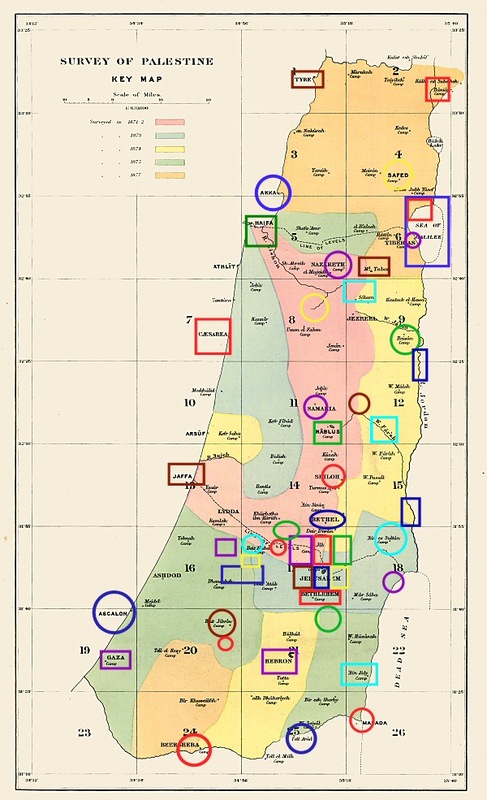 The maps of the Survey of Western Palestine captured the land before these momentous changes. Though there are some significant advantages to an electronic edition of the maps of the Survey (see below), the primary motivation for publishing this work is to provide access for scholars, teachers, and students. These maps are rare, and few libraries have copies. Those that do naturally restrict access in order to protect the maps. 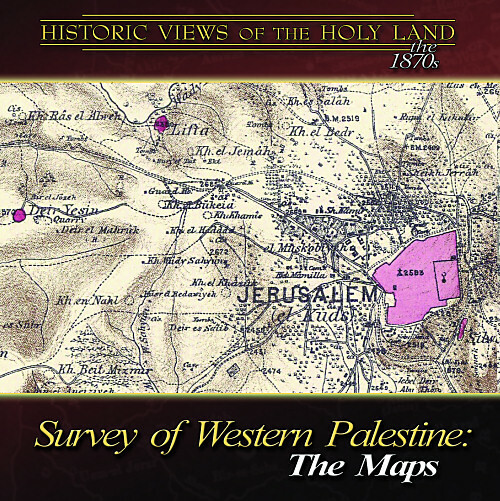 Recently, a reprint was published of the Survey of Western Palestine by Archive Editions Limited. This is a very welcome publication, but its cost of $4,795 for the 13-volume set makes it unaffordable for most individuals and for many libraries that don't have specialized collections. Those interested in only the maps will find that they are not available separately. Furthermore, the maps were produced at a reduced size (80% of original), and the print quality makes it difficult to see detail and to read some of the place names. This electronic work makes it possible for all to have quick access to the original documents in the highest resolution and in full color. This electronic edition is a republication of the original; no alterations have been made to the maps. 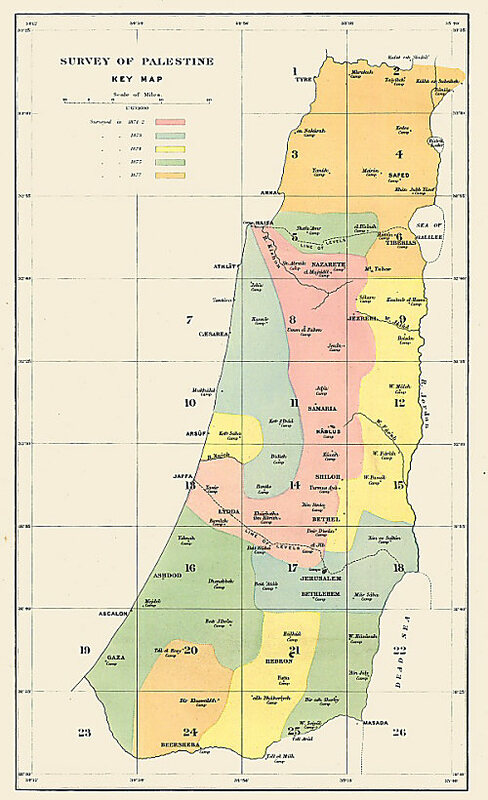 One additional map not published in the original series has been included: a map made by later surveyors of a portion of Eastern Palestine (modern Jordan). 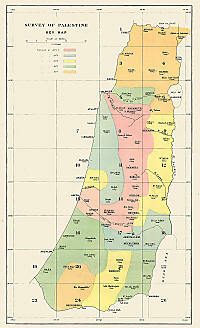 Unfortunately, the Survey of Eastern Palestine was never completed. The detail of this map is extraordinary. Th e surveyors distinguished between vineyards, orchards, gardens, woods, scrubs, palms, and fir trees. The locations were designated for winepresses, milestones, tombs, wells, cisterns, and caves. The team surveyed successive regions, the dates of which can be seen by the color coding on the "Key Map." 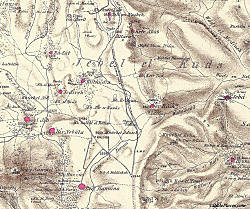 The survey covered all of the territory west of the Jordan River between Tyre in the north and Beersheba in the south. The original names of many ancient and biblical sites are preserved in the Arabic names of the villages, including: er-Râm (Ramah), el-Jîb (Gibeon), Jebá (Geba), Kabur el Beni Israin (Tombs of the sons of Israel), Mŭkhmâs (Michmash), Lifta (Mei Nephtoah), Beit Jibrin (Beth Guvrin), Beit Ur el Fôka (Upper Beth Horon), Beisân (Beth Shean), Khŭrbet Tekûá (Tekoa), Tell Hum (Capernaum), el Mejdel (Magdala), Kh. Kerâzeh (Corazin), Ain Shems (Beth Shemesh), Sŭrah (Zorah), Tell Jezar (Gezer), and many more. In the 1870s, the population of Palestine was approximately 450,000; today the population of the same area is nearly 7 million. Much of that growth is in the urban centers. 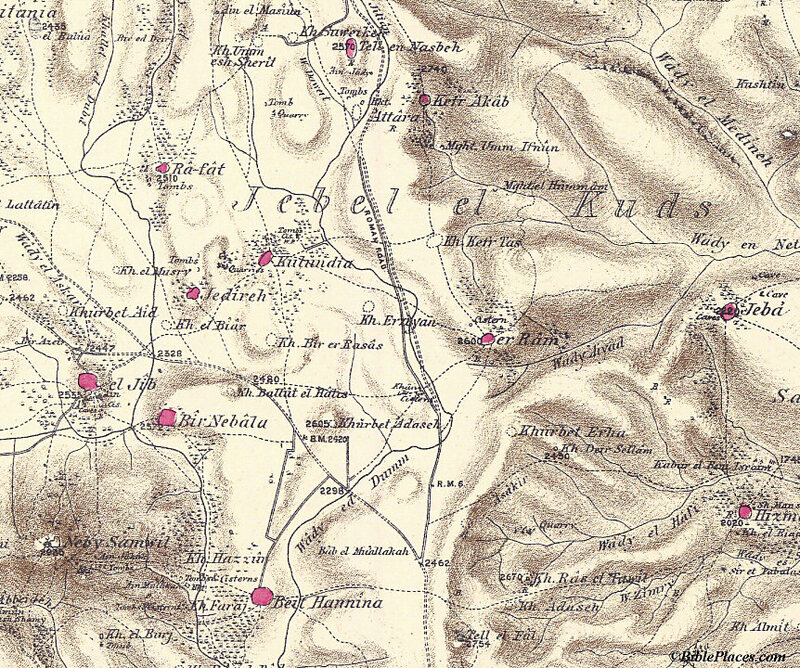 A look at the maps of the areas of Jerusalem, Jaffa (now Tel Aviv), Haifa, Tiberias, Nazareth, Beersheba, Hebron, and Nablus reveals just how much has been lost to modern development. Many more interesting details of the Survey project are given in the book by the Palestine Exploration Fund, Thirty Years' Work in the Holy Land (1895). Extracts from this book about the survey are included in the volume and are recommended reading. The first section included describes the publication of the work, and the second details the research done by others before the Survey commenced. This is followed by information about the preparation for the survey, the survey itself, and finally a summary of the contributions that the Survey has made to our knowledge of the Holy Land. Altogether, these will increase your appreciation for the project hailed as "the most important work on the Holy Land that has ever been given to the world."